Each set consists of (2) tables for a variety of merchandise. 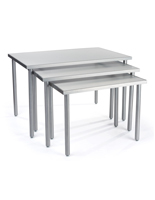 Tables are constructed with a steel frame & MDF top for lasting use. 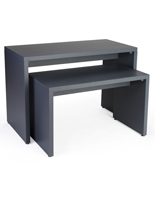 Silver powder coated finish & the black top seamlessly coordinates with any décor. All hardware & instructions are included for quick assembly. These modern nesting tables, also called pieces of retail furniture, have MDF countertops. This fixture has a contemporary design making it ideal for most clothing shops! These modern nesting tables are available in sets of (2). 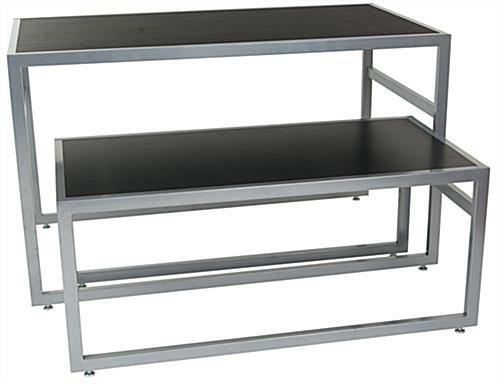 The larger furniture top is 55”w x 30-1/8”d for fitting multiple pieces of merchandise at a time. These modern nesting tables are designed to easily fit the smaller unit partially under the larger one for a waterfall design. The smaller unit measures 48”w x 24”d. 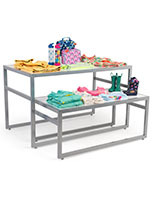 These contemporary retail counters, modern nesting tables have 10-5/8” clearance between the top and the bottom. Each furniture display is designed to easily place stacks of merchandise on either shelf. These modern nesting tables that have a thick MDF countertop are made for holding various types of merchandise. 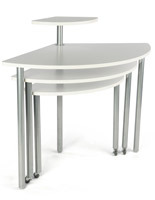 Each retail furniture display’s MDF top has a black wood grain laminate finish. 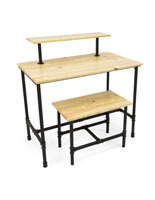 These modern nesting tables that are constructed with a steel frame are made for lasting use. Each contemporary display has a silver powder coated finish on the steel frame. 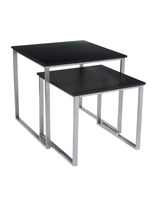 These modern nesting tables that have a 32-3/4” tall countertop are ideal for holding merchandise, ideal for any retail establishment. The smaller countertop is 21” tall, for easily placing under the larger counter. These modern nesting tables takes mere minutes to assemble. Two associates can easily put these displays together with the included hardware and instructions. 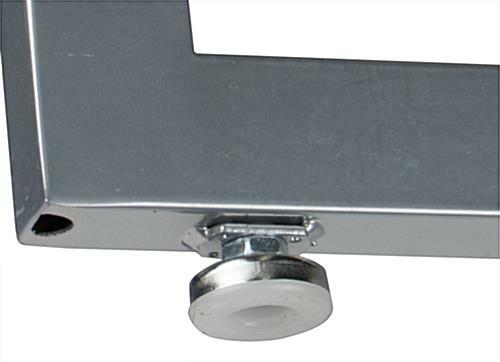 These retail units come with (4) adjustable feet for stabilizing the furniture even on slightly uneven surfaces. 48.0" x 21.0" x 24.0"
55.0" x 32.8" x 30.1"